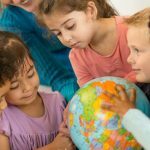 Should your child be getting one therapy or the other or both? A clinic therapists goals regarding occupational & physical therapy or the family’s functional goals and the goals of the school’s therapist often differ. 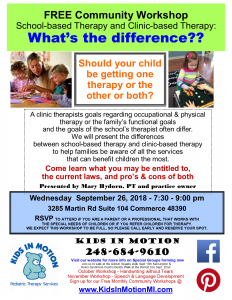 We will present the differences between school-based therapy and clinic-based therapy to help families be aware of all the services that can benefit children the most. RSVP TO ATTEND IF YOU ARE A PARENT OR A PROFESSIONAL THAT WORKS WITH THE SPECIAL NEEDS OF CHILDREN OR IF YOU REFER CHILDREN FOR THERAPY. WE EXPECT THIS WORKSHOP TO BE FULL, SO PLEASE CALL EARLY AND RESERVE YOUR SPOT.